Special Containment Procedures: SCP-1523 is to be secured in Storage Locker L at Site 40's Safe containment facility. When testing, SCP-1523 is to be lit with a handheld gas lighter. While SCP-1523 is burning, it is to be enclosed in an airtight chamber with all attending personnel wearing gas masks to avoid propagation or inhalation of SCP-1523 smoke. All interactions with SCP-1523 are to be recorded and filed in Interview Log 1523. When testing is concluded, SCP-1523 is to be extinguished promptly. The object is never to burn while unattended. 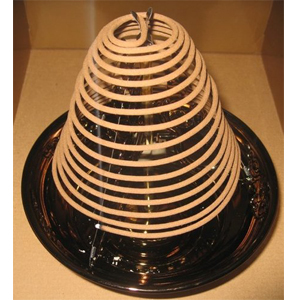 Description: SCP-1523 is an orange-brown incense coil. While SCP-1523 is burning, the object displays sapience; it is responsive to verbal stimuli and capable of speech, using a voice identical to that of a musician named █████████████1 The object possesses complete memory of █████'s life2. The Foundation cannot determine whether SCP-1523 held the same personality traits in life; its current demeanor, including its obsession with religion, may result from its current form. According to SCP-1523's account, it was created on 05/04/05 in a "star chapel" of the North American cult known as the Fifth Church during a "cleansing ritual". SCP-1523 was stored in a closet, suspended on an incense holder which bore a tag reading "BROTHER █████ TERRES TRIAL MIND". Following a Foundation sting (see EID Operations Report 6-11-05, "Operation Stargazer"), several ritual items were secured, including SCP-1523, which underwent experimentation due to its unusual nomenclature, then was designated and contained. Addendum 1523-A: After testing (see interview logs), it has been determined that SCP-1523's ability to hear and speak is a property of its smoke, rather than of the object itself. Although SCP-1523 is apparently not conscious when unlit, attempts to determine the range and duration at which SCP-1523 smoke retains its effect have been inconclusive. Note that Site 40 cleaning procedures are to be strictly enforced, to prevent the contamination of the facility with SCP-1523. Note: All information pertaining to classified Fifthist activity has been redacted as per Operation Stargazer protocol. SCP-1523: Call me ████████, star-exalted brother. Interviewer: I will keep using your designation, if that's alright. So can you confirm that you are ████████ █████? Interviewer: And you're aware of your state? Interviewer: Are you capable of anything besides speech? SCP-1523: Hertz, brother, I can sing. Interviewer: Can you perform something for the record? SCP-1523: You got any requests? SCP-1523: It serves, brother. It serves. Let me put a spin on it. Interviewer: [pause] That will do. Can you tell us how you were placed in your current state? SCP-1523: Wisdom serves. It was a [REDACTED] cleansing ritual. Everyone was in the groove as the archon played. Spinning like records. Screaming like records, too. [laughs] My [REDACTED] unhinged like a snake's jaw, and my soul came forth, brother. The archon stuck it here for posterity. Interviewer: What happened to your body? SCP-1523: Still going strong. It doesn't miss me much. Interviewer: You're saying that your body continues to function without a consciousness. SCP-1523: No, brother, without a soul. Ever seen an anthill? That ant doesn't have room for a soul in there. If a man has no soul, he can keep building his anthill just fine. Right now the man I was is occupied with [REDACTED] and you couldn't tell the difference if you met it, unless you were giving it a throat exam. [laughs] He's quiet in there, but he wriggles around like he can't get comfortable. Interviewer: Is this a common phenomenon? SCP-1523: More than you think, brother. I'd bet my blood there are brothers and sisters working with you in this building whose souls left a long time ago. Bodies serve, too. But those sweet souls [REDACTED] in time. It's coming for them in time. Note: This interview, like the previous one, was conducted in a standard humanoid interview chamber, and as such, the only precaution taken was the presence of a security official. This interview was conducted by a different researcher than the previous conversation: Dr. ███████ is a 35-year-old woman. Interviewer: Can you tell us anything about the chapel you attended? Interviewer: I'm more interested in knowing their rituals and beliefs. SCP-1523: I'm more interested in you. Interviewer: Can we please stay on the subject, SCP-1523? SCP-1523: Sister, I'm tired of talking about myself. I haven't spoken to a woman in too long, and you've got too much going on to be so impersonal. SCP-1523: Don't get ahead of me, now. Just tell me about yourself, sister. Interviewer: [Security Officer] ████, how do I get him back on subject? Security Officer: SCP-1523, answer her questions. SCP-1523: Sister, lean a little closer. Take a deep breath. There's something I need to tell you. SCP-1523: You want me to be helpful. Do your brother a favor. [The interviewer complies.] Mmm, that's it. Hope you like the smell of sandalwood, baby. I want to linger on your clothes all day. Interviewer: SCP-1523, what are the central tenets of the Fifth Church? SCP-1523: Just so you know, I'm not the body, baby. I'm the smoke. Every particle in the air's my senses, like the sweet tendrils of [REDACTED]. Breathe in, breathe out. It's so comfortable in your chest, sister. Interviewer: This is over. I'm getting the hell out of here. SCP-1523: Don't be scared, baby. You'll hyperventilate trying to get me out. But you can't. I know you'll be a stranger to me, but I'll see you 'round. My body burns and rests and burns, but I'll be on the air 24/7, if you know what I mean. [laughs] I'll see you in your office. 1. Name withheld due to Operation Stargazer protocol. 2. Born in 1951, █████████████ achieved fame in the 1970s as a rhythm-and-blues singer, known for his characteristic low voice and range, as well as his brief time spent as a member of the band The Fifth Dimension.